Well, I'm finally getting to post this card. I made it yesterday morning, but with all the general living and car maintenance needing to be done I'm just now getting back into my studio. 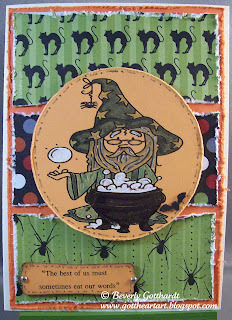 Dumbledore is a digi from Bugaboo Stamps, and my friend who has read all the Potter books and is a big fan looked up this quote for me and I created it on the computer to fit the Modern Label punch. 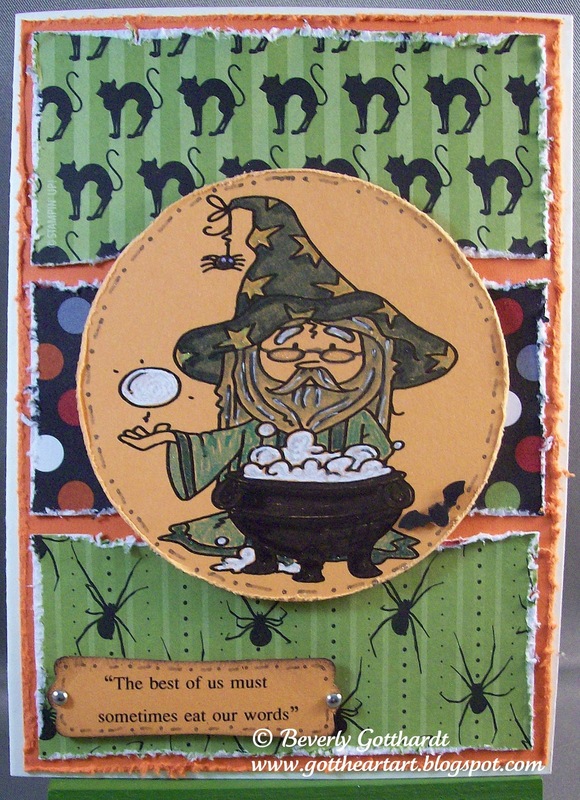 I printed Dumbledore on Peach Parfait card stock and colored the rest of him with Stampin Up markers, a white gel pen, and Spica Glitter pens. Spiders, cats, and a tiny bat finish this off for a Hogwarts look. Supplies: Ivory Card Blank 4" X 5 1/2" Halcraft, Papers: SU-Peach Parfait, Dusty Durango, Designer Series Paper Frightful Sight, Stamps: Bugaboo Stamps-Dumbledore digi, Ink: Ranger Archival Ink-Jet Black, Sakura Gelly Roll Pen-White, SU markers-Sahara Sand, Basic Black, Basic Gray, Spica Glitter pens-clear, gold, turquoise, olive,Tim Holtz distress tool, Fiskars shaper cutter template-Circles-1, SU-Modern Label punch, The Paper Studio Spare Parts-tiny silver brads, SU dimensionals. Awesome Beverly...I love Harry Potter and will be reading book one to the class starting next week! Thanks for joining us at the Paper Players. Beverly, This is such a great card. I love how you frayed all the edges of the DSP. The image is so cute and I LUV that sentiment. Thank you for playing along with The Paper Players this week! What? Nobody told me there were Harry Potter stamps! Love this! The papers work so well with that awesome image! Thanks for joining the Paper Players this week. What an adorable image, Beverly! I love the papers you selected as well as the sentiment! Great job! Thanks for playing with The Paper Players this week! Great card! The papers and distressing really work well with the image! Great card! I love the distressed edges and your sentiment tag. Thanks so much for joining us this week at the Paper Players. Great Card!! Thank you for Joining us at Forever Night Challenges " World of Hogwarts"